For as long as I can remember I have shot pictures of my wife and I on holiday with a compact camera at arm’s length. I have examples in the family album dating back to 1984 and, whilst I’m not claiming to have invented “The Selfie”, it really isn’t anything new in our house. We started doing those pictures just because there was never anyone else around to take the picture for us and so it was very much a second best picture. Slowly and over the many holidays that we have enjoyed together it became something of a tradition to do at least one of those arm’s length couple pictures but we always liked to get a passer-by to do the picture if we could. It is a phenomenon that I am fascinated by and I often shoot pictures of people as they perform the Ritual of the Selfie. Olympic and Commonwealth Gold medallist Laura Trott posing with riders on The Mall in a break between media interviews during the Prudential RideLondon Freecycle event. ©Neil Turner, 9th August 2014. I was prompted to compose this blog post because I suddenly realised why it works so well. One of the media team working with Prudential RideLondon had offered to take the picture and the three young women dutifully posed but their faces didn’t come alive until they rescued the phone and performed the ritual of the selfie. There seems to be a confidence and a joy in taking your own picture of yourself and your friends or, in this case, you, your friend and an Olympic and Commonwealth champion. Is it because these days that can see themselves in the screen and only shoot when they are happy with what they see? I believe that there’s an element of that in it but the sense of self-reliance is just as important as far as I can see. There is a joy in The Selfie that is missing from a perfectly well taken group photo. Time after time we all saw people enjoying taking self portraits during the event and that’s the case almost everywhere almost every day. Where I depart from the celebration of The Selfie is where media outlets and PR companies encourage people to do it and post them as part of marketing campaigns. For me the innocence and joy of the ritual gets lost when it is prompted like that. Where I also have an worries about it is when people do it dozens or even hundreds of times a day. I had a link request on EyeEm the other day from a guy who have over 6,000 images on his account and, from what I could see, they were all of himself. I don’t object to The Selfie at all. In fact I indulge in the ritual myself from time to time. All I’d ask is that marketing people without another great idea stop trying to make something from them that isn’t really there. Photography is about a lot of things and fun is right up there as one of the most important. 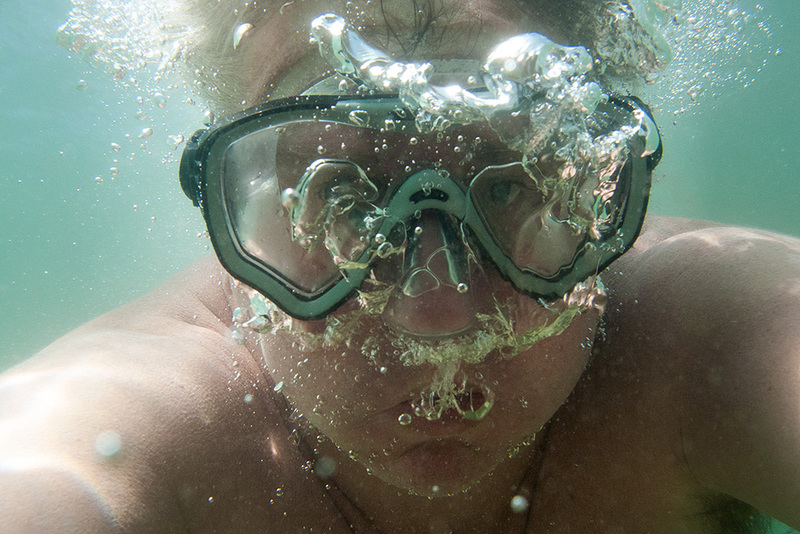 The one “selfie” that I do like of mine – under water at the beach in Bournemouth in the summer of 2013. ©Neil Turner. And on that theme, I have sometimes thought that a mirror around the camera lens would be good – a mirror in which the subjects could compose themselves – an all senses of the word. It’s perhaps interesting to note that smiling for a photographic portrait didn’t start until the late 1800s. Until then, the common practice was to look serious (even when shorter shutter speeds were used). Today, we still put on our serious face when we have to do a “photographic chore” such as posing for a passport photo or driver’s licence picture. What happened in the late 1800s to bring a smile to people’s faces? You can probably guess. Thanks to George Eastman, the Kodak moment was born and photography was no longer a chore. Eastman put photography into the hands of the masses (albeit the slightly wealthier masses). Today, cellphone cameras truly put photography in everyone’s hands.